More of a smoked haddock soufflé really. 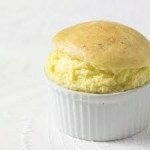 The quantities will serve 4 people as a main course, but if you want to do it as a starter, you can put the mixture into ramekin dishes and cook in the oven instead. This will be enough for 6 to 8 ramekins, depending on the size of your dishes. Pour the milk into a saucepan with a slice of onion, a bayleaf, a couple of slice of carrot and 3 or 4 whole peppercorns. Bring almost to the boil. Place the Smoked Haddock in a flat dish and pour the milk over it. Leave to stand for ten minutes by which time your fish will be cooked. Remove from the milk, skin and flake the fish carefully checking for bones. Strain and reserve the cooking liquid. Melt half the butter in a small non-stick saucepan, add the flour and stir over the heat for one minute or so. Next add half the milk in which you poached the fish, and cook gently for a minute or two, until the sauce thickens. Separate the eggs and beat the yolks with 2 tablespoons of the cream. Season with pepper only (salt is unnecessary due to the saltiness of the fish). Stir this into the white sauce. Add the Smoked Haddock and half the Parmesan. Whisk the egg whites to medium peaks and fold very gently into the sauce. In a non-stick oven proof frying pan, melt the remaining butter, coating the whole pan with melted butter. When nice and hot, pour in your mixture and cook until it starts to set. At this stage, sprinkle the remaining Parmesan over the top and pour over the remaining cream. Place under a pre-heated hot grill until golden and delicious. Serve with lots of crusty bread for mopping up every last bit!